President Trump has stated that his economic policies would boost average U.S. economic growth to at least 3½ percent per year, with the potential to reach 4 percent. Some of Trump's policy proposals, such as tax cuts and infrastructure spending, indeed could boost growth over the next couple of years. Such a boost would lift living standards and be a welcome change for all Americans. But ongoing growth, not just a short spurt, is required to continue raising living standards. The arithmetic of growth, and the experience of the past half-century, suggest it unlikely that sustained growth of this magnitude is possible. Ongoing growth, not just a short spurt, is required to continue raising living standards. Compared to the way the U.S. economy has performed over the past ten years, a pickup in economic growth to 3½ or 4 percent per year would be a dramatic shift. Growth in the nation's real gross domestic product (GDP) has averaged less than 1½ percent over the past decade (see the solid blue line in the chart which shows a smoothed path, that is, a 10-year moving average, of real GDP growth). There are episodes of sustained growth in real GDP at rates faster than 3½ percent in the U.S. in the past, most notably from the mid-1940s to the early 1970s. More robust growth would make a big difference: if real GDP rose at a 4 percent pace rather than a 2 percent pace over the next 10 years, then the income of the average American would be about $14,000 higher in 2027, based on the Census Bureau’s population projection and controlling for inflation. The speed at which the economy can grow over a longer horizon is determined by changes in two main factors: the total amount people are working — which involves both the number of workers in the labor force and the hours they work — and the efficiency with which they produce goods and services. This means that boosting real GDP growth to 3½ to 4 percent on a sustained basis would require either large increases in the growth of the labor force or in worker productivity, or some combination of the two. Unfortunately, these elements are very unlikely to grow at the rates required to reach 3½ to 4 percent sustained economic growth. The labor force has been rising very slowly in recent years: just ½ percent over the past 10 years, and its growth has been trending down since the 1980s (see red dashed line in chart – like GDP, this is also a smoothed average). This downtrend reflects the topping out of women’s entry into the labor force and, more recently, the ongoing retirement of Baby Boomers. Unless people start working more years, immigration picks up, or fertility rates increase, the labor force is unlikely to grow more rapidly on a sustained basis. Trump’s policies seem unlikely to significantly boost labor force growth. Indeed, reductions in immigration or increased deportations would hold it down. Productivity also has been rising slowly recently, with business sector output per hour rising at an average of just 1¼ percent over the past ten years (see the green dash-dot line in chart that represents a smoothed average of this variable). 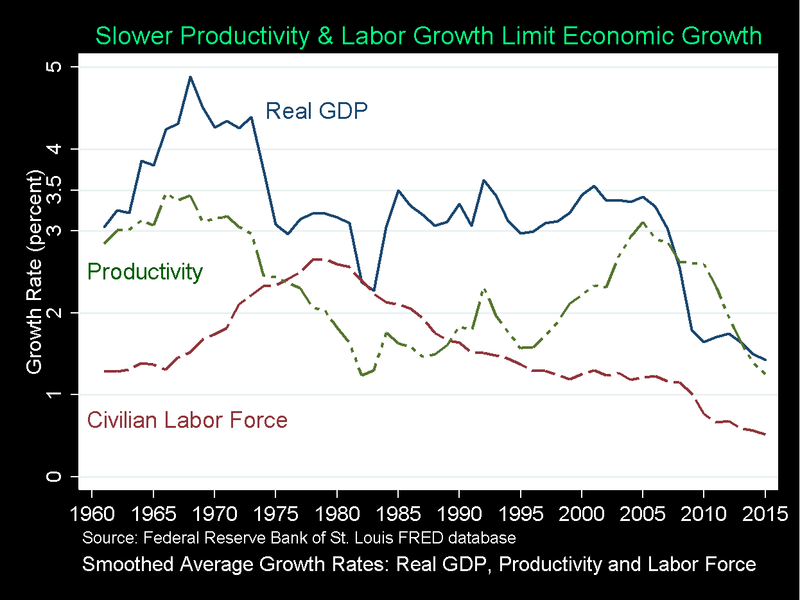 This weak rate of productivity growth is well below the pace that prevailed over the decade ending in about 2004, when growth was fueled by the spread of the internet and related information technologies, as well as during the “golden” era of growth in the 1950s and 1960s. Economists are actively debating the reasons for the recent slowdown, but no credible economic forecasters or analysts believe that productivity growth could rise enough on a sustained basis to achieve Trump’s goal for real GDP growth. In particular, given the likely sluggish increases in the labor force, labor productivity would have to rise to 3 to 3½ percent a year to reach the President’s promise. Among economists who study productivity, a very optimistic view is that the underlying trend in productivity growth could pick up to 2 to 2¼ percent in coming decades (see here for an example of the range of predictions for labor productivity growth.) The right way to think about 2 percent versus 3 percent is not that 3 percent is 1 percentage point higher, but that it is 50 percent larger than 2 percent. Therefore, while Trump’s policies could boost growth over the next couple of years, a sustained rise to the rates he has promised seems far out of reach. Given the arithmetic of GDP growth and the improbability of a large enough boost in growth of the labor force or productivity, Trump’s promise of 3½ to 4 percent growth seems very implausible on a sustained basis. Indeed, a hole-in-one at one of Trump’s premier golf courses seems like a better bet.